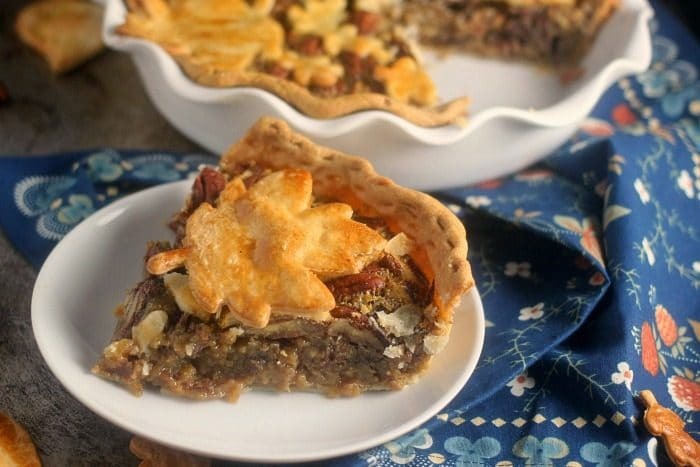 Maple Syrup, bourbon, and toasted pecans create an incredible depth of flavor in this Salted Maple Pecan Pie. You won’t get any complaints that the pecan pie is too sweet with this version! This week I have been on a mission to resurrect the pie I hate: Pecan Pie. I’ve never understood it’s place on every Thanksgiving table. There are so many other pies worthy of their place! Why don’t I get it? Why does everyone else love pecan pie and to me it just tastes like I’m eating straight sugar that happens to have some pecans in it? So I really analyzed my beef with pecan pie this week and developed a plan to create a pie that would make me love this signature Thanksgiving dessert. And you know what, I did it! My two main issues with pecan pie are that it is sickeningly sweet and that is has a very one note flavor profile. To address these two issues these are the changes I made to the standard Karo syrup pecan pie to create one that is truly worthy of it’s place at the table! And thus, I present to you the pie that will make all of the pecan pie haters fall in love: The Salted Maple Pecan Pie! I almost always opt for a pie crust that doesn’t contain sugar in almost any pie. I love the balance of the saltiness with the sweet filling. This was especially important for my perfect pecan pie because the sweetness is so over the top. Also, traditionally pecan pie is a single crust pastry without any pie crust on top of the filling. I opted to use some decorative pieces of crust on top so that there was a bit more of a crust to filling ratio. Toasting the pecans in the oven or on the stove-top until they are fragrant before adding them into your filling really brings pecan pie to a while new level. Toasted nuts have much more depth of flavor and simply taste better overall. It isn’t only a great idea for pecan pie, it’s a good idea for any recipe utilizing nuts. I was determined to make this pecan pie without corn syrup. I don’t understand it’s place in this pie. I know it is the traditional ingredient but the only thing corn syrup brings to the table is sweetness. I wanted to opt for a syrup that brought sweetness (but less so than corn syrup) and also flavor. Maple syrup seemed like the most obvious choice and it proved to be a good one. I can’t tell you how many pecan pie recipes I read this week and I can’t believe how many of them didn’t have even a pinch of salt in the filling. This is maybe the most influential change I made to the classic pecan pie to balance its sweetness. In my quest to really amp up the flavors that weren’t just sweetness in pecan pie, I decided that adding some bourbon was a good idea. This only further cuts the sweetness and also adds warm bitter notes. While I am totally on board with this new pecan pie I have created, I was even more on board when I tried a filling version that included some bittersweet chocolate mixed in. Now we’re talking! Granted, it is pretty much a different pie at this point but a totally delicious pie at that! Highly recommend trying this version at least once! Pie crust can be made up to 3 days in advance and kept in the refrigerator. I highly recommend this so the process moves much quicker when you are ready to assemble and bake the pie. 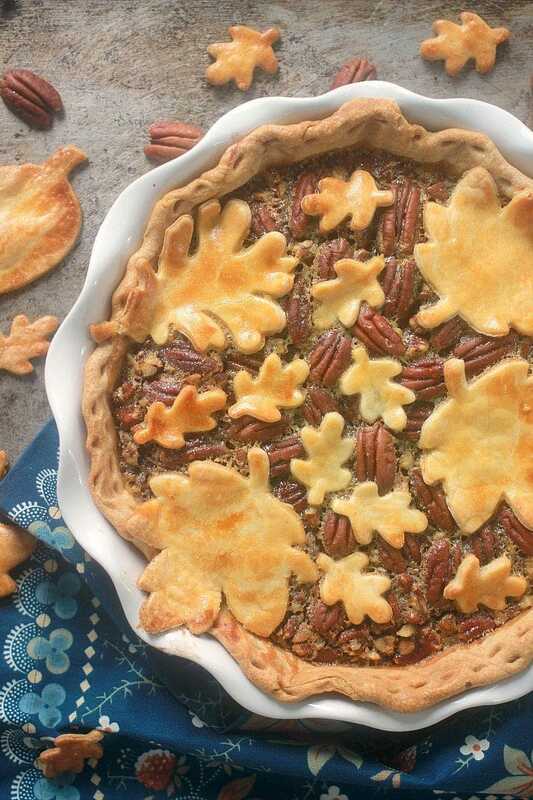 Use the pie crust scraps to cut out decorative pieces of dough using a cookie cutter to decorate the top of the pie. This lends to a larger crust to filling ratio which helps balance the sweetness. Definitely do not skip the toasting of the pecans step. This truly brings out all of the flavor potential in the pecans. They will taste flat without this step. Chop half of the pecans to go into the filling and save the other half of the pecans to place on top to create a beautiful look to the top of your pie. Wrap the edges of the crust in tin foil if they begin browning too much during baking. Bake the pie in the lowest position in the oven so that you can prevent a soggy crust. Maple Syrup, bourbon, and toasted pecans create an incredible depth of flavor in this Salted Maple Pecan Pie. You won't get any complaints that the pecan pie is too sweet with this version! For the Crust: If you are intimidated by making pie crust, I highly recommend checking out my Complete Guide to Pie Crust article and tutorial video before starting. Before starting your crust, cut your butter into small 1/2″ pieces and place it in the freezer to get very cold for about 15 minutes while you organize the rest of your ingredients. In a large mixing bowl, whisk together the flour and salt. Add the butter and shortening to the bowl and use a pastry cutter or a fork to cut the fat through the flour until it is evenly distributed in pea size pieces. Add ice water to the bowl 1 tablespoon at a time and use a fork to gently nudge the flour into the water. Do not aggressively stir or mash the flour and butter down. Be as light and gentle as possible. Once large clumps of dough start forming, gather the dough up and press it together. If it crumbles then you need to add a little more water. If it holds together then you are ready to chill. Press the dough together into a ball and wrap it in a piece of plastic wrap, pressing it down into a disk. Refrigerate for at least 30 minutes or up to 3 days before using. This step is key to relaxing the gluten and allowing the dough to hydrate properly. Before rolling out the dough, allow it to come back near room temperature. Meanwhile, position your oven rack on the lowest position possible and preheat your oven to 375F (190C). Roll the dough out to a circle several inches wider than your pie plate. Transfer the dough into the pie plate and trim and crimp the edges. Save you scraps of dough to cut out decorative pieces for the top of the pie if desired. Place a piece of parchment paper over the dough and fill it with pie weights, rice, or dried beans. Place the pie plate on a sheet pan and blind bake the crust at 375F (190C) in the lowest position in the oven for 20 minutes. Remove the parchment and pie weights and bake for 10 minutes more. Meanwhile, prepare your filling. You do not need to wait for the crust to cool after par baking to add your filling and bake it. In a dry pan over medium heat, toast the pecans, tossing frequently, until they smell very fragrant and nutty. Watch them closely so they do not burn. Remove them from the pan. Save half of them to decorate the top and roughly chop the other half. In a large mixing bowl, whisk together the butter, eggs, brown sugar, maple syrup, salt, bourbon, pecans, and chocolate chips if using. When the crust comes out of the oven, pour the filling into the baked crust. Use the pecan halves that didn't get chopped to place nicely on top of the filling. 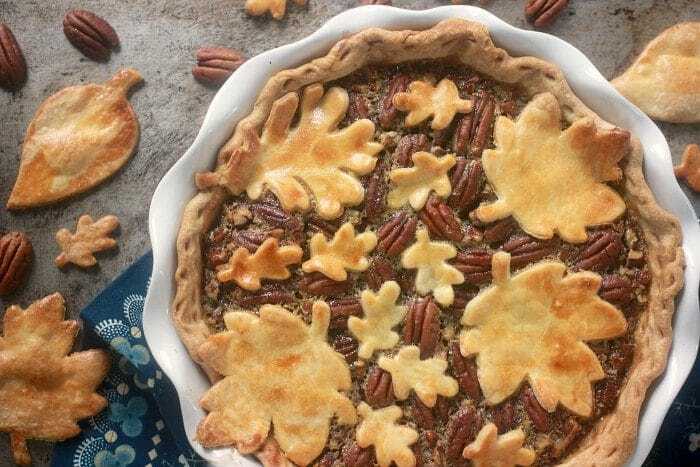 If using, brush the decorative pie crust pieces with a whisked egg and place on top of the pie, leaving some blank spaces to let the pecans show through. Bake at 375F (190C) for 35-40 minutes until the pie is set but still has a slight jiggle to it. Watch the edges of the crust, as they can tend to over brown. You can wrap the edges in a ring of tinfoil to prevent them from burning. Allow to cool for at least 4 hours before slicing. Cover the cooled pie with foil to store. If you are serving it the next day, you may leave it out at room temperature. If you need to store it for longer, it may be refrigerated for up to 4 days. You can prepare your pie dough up to 3 days in advance and store in the refrigerator. Place your pie plate on a sheet pan to bake it on because it makes removing the pie from the oven easier and also conducts heat onto the bottom of the crust, preventing it from being soggy. I LOVE the changes you made!!! You really helped balance the over-sweetness! I’m making this now and wondering if the filling is supposed to be so thin. I’m used to a much thicker consistency. Hi there! Yes it is a pretty thin mixture before it bakes. It will thicken up! Let me know how it goes!